Directory Home » eBizTrait Technolabs Pvt. 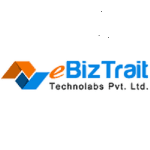 Ltd.
EBiztrait Technolabs Pvt. Ltd. provides web and mobile app development, website design, digital marketing, ecommerce app development, graphic and logo design. EBiztrait Technolabs Pvt. Ltd. works with businesses globally with offices in the U.S. and India.